Dr. Brown's Baby is currently conducting several baby bottle studies, and they are looking for families to participate in testing new bottle designs. Participants will be mailed products to review and (depending on the study) will be asked to complete a short survey with their feedback of the bottles. You do not need to be a Dr. Brown's user to participate. If you (and your baby!) 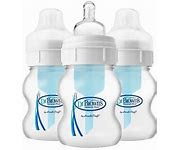 are currently using baby bottles and are willing and available to test and review a new set of bottles in December, then please enter your information. They are looking for 500 families to participate in the product tests. Participants will be selected upon order of entry. Upon acceptance, They will email you to confirm your participation in the study and then mail products out for use and feedback.